Vintage and classic car battery leaflets. Homepage. This page: Original leaflets show the correct style of battery to fit on classic cars that are now in preservation. Car batteries in the 1950s and 1960s. New battery fitted to an old car. Go to any show, and many finely restored vintage and classic cars are displayed with their bonnets raised, showing visitors the endless lengths that the owner has gone to during the car's restoration. Many though are let down visually by modern and inappropriate-looking batteries, often emblazoned with gaudy stickers and warning messages. Old-style rubber-cased batteries are still available, the leaflets below illustrate the type of car batteries that would have been fitted to cars in the 1950s and 1960s. Anyone wanting to restore their car's underbonnet area to how it would have looked in that era, needs to look out for a period-correct battery like those shown below. 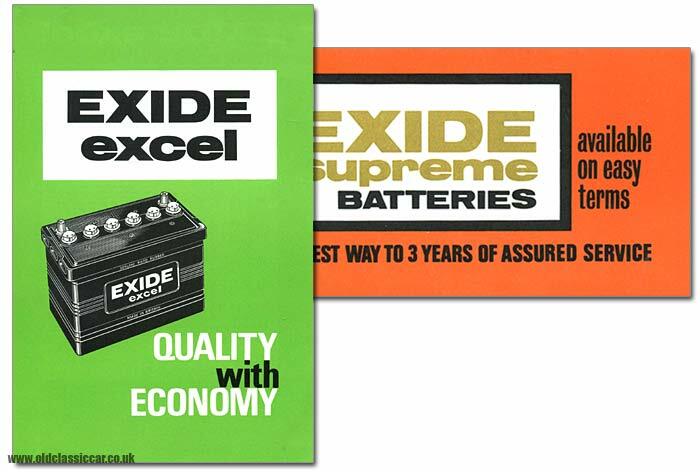 The first couple of leaflets advertise Exide batteries, and were collected at a Motor Show in 1967 or 1968 (both are dated 1967). The green leaflet promotes the Exide Excel, a classic black rubber-cased battery. 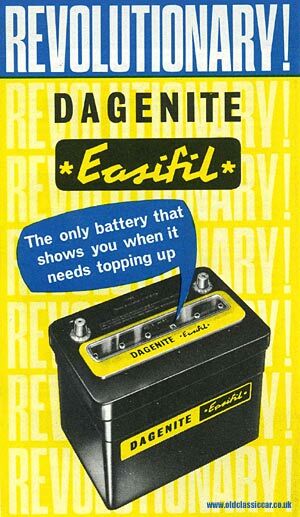 Various batteries of different amperage were on offer to suit all the popular cars of the late 1960s. For instance, £5 12s 6d would buy you a battery to fit Austin and Morris Minis, including the Riley Elf and Wolseley Hornet. The CJ9 model, priced at £7 6s 6d, could be fitted to any of the following: Austin A60, A95, A105 and A110, Humber Hawk, Super Snipe, MG Magnette, Morris Isis and Oxford, Riley 2.6, 4/68, 1.5 and 4/72, Rover 95, 100 and 110 (P4), Triumph 2000, Wolseley 6/90, 6/99, 6/110, 15/50 and 16/60. As with all Exide Excel batteries, each came with a 12 months' guarantee. The smaller Exide leaflet advertises the merits of the Exide Supreme battery, one that came with 36 months guarantee as standard. Because ".. a new battery is a major item in the motoring budget ..", there was a flexible payment plan available. If buying a new battery was too much of an expense in one go, you could put down a 20/- deposit, and follow that with six monthly payments thereafter. An illustrated invoice from a supplier of Exide batteries in the 1930s, can be found on this page. This leaflet also dates to the mid-1960s, and features an illustration of the "revolutionary!" Dagenite Easifil on its cover. Offering "at-a-glance inspection", you could peer in through a transparent cover on the battery's top surface to gauge whether it needed topping up or not. Each cell incorporated an indicator that floated in the electrolyte. When the white stem of the indicator was visible, ie floating on the top of the electrolyte near the inspection window, that indicated that no topping up was required. When the level dropped, and the black tip of the indicator became visible, that was the nod to top up that particular cell. To top up the cell, you removed the single centre cover on the top of the battery, under which there was a trough. You poured water into the trough until it was full, the water automatically making its way into the cell(s) that needed a boost. The indicator in each cell acted as a valve, allowing the correct amount of distilled water to replenish it as required, the unused water remaining in the trough until such time as one of the cells needed a little more. I'll add in some illustrations of earlier car batteries to this page shortly.